Item as described; fast shipping. Thank you for a smooth transaction! Great deal, fast shipping, great packing. Highest recommendation! "Honey, I Shrunk The Kids" is a really fun family film. The special effects still hold up to today's standards and are really amazing. 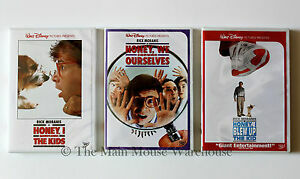 Rick Moranis is great as Wayne Szalinski, the scientist father working on a machine that can shrink objects. But his machine is a failure until one of the neighbors hits a baseball through the attic window, bumping into the machine. When the two neighbors - Russel and Ronald - and Wayne's kids -Amy and Nick - go up to retrieve it, they step in the way of the beam and.... SHRINK! From then on it's a wild adventure that takes them from the attic (in a garbage bag) to the backyard. They have to get back to the house so that Wayne can get them back to normal size. We all dream about far away places and new lands (at least I think we do! ), but the unchartered territory for the majority of this film is different - it's right in the back yard! Blades of grass become slides, bumble bees become giant monsters, and everyone loves "Anty." And then of course comes the lawn mower... Their is comedy, romance, action, and adventure - something for everybody and more. "Honey, I Shrunk The Kids" is a memorable flick, that will stay with you. Having always been fascinated with the concept of how different the world around us would look if this sort of thing was possible, I have long been enthralled with this film ever since I first glimpsed it years ago. Even after all these years of progression in special effects, this movie never fails to capture my imagination, even if parts of it do look fake or cheesy, there's just something so compelling about seeing a solid anamatronic ant. Part of what makes the film still work is how you get to know the characters before the adventure begins and that the actors are generally believable in their distinct roles. Another key ingredient is James Horners zany, adventurous and even stirring score. The opening theme is very reminiscent of the Simpsons, which makes sense, as they made their debut the same year. All in all a must for any fan of 80s nostalgia or light science fiction! Funny & entertaining, 8 yr. old granddaughter really enjoyed this movie & has watched it several times already. Great movie for my six year old grandson. Also had me entertained as well. Thanks so much, love this classic movie.